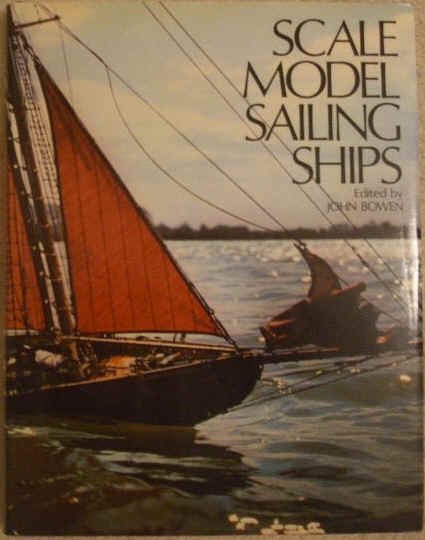 First edition, second revised impression hardback of SCALE MODEL SAILING SHIPS. Edited by John Bowen and published by Conway Maritime Press Ltd., London, in 1979. The book is in very good condition (Clean black cloth boards with gilt lettering on spine) with minor wear to the illustrated dust jacket which is not price clipped (light creasing to the edges). Internally, the pages are clean and tight and there are no tears and no inscriptions. There is minor yellowing to the pages. Eight chapters on the art of model making, which each contributed by highly qualified model makers and edited by John Bowen. All the modelmakers have won outstanding awards at national exhibitions and rallies for their models, and all are frequent contributors of Model Shipwright. "A beautifully turned out model of a sailing ship is always a source of wonder and envy, but many a newcomer to this fascinating hobby will despair at ever being able to achieve suh perfection. This need not be so, for the essential techniques are straightforward and easy to acquire - and one of the easiest ways to learn is from other, more experienced ship modellers. In Scale Model Sailing Ships the experience of internationally famous modelmakers has been set for the benefit of all those aspiring to higher standards. Each contributes a chapter about his chosen field, but all concentrates on three types - the galleon, clipper, and the fore-and-aft rigged coaster - as representative of the problems and pitfalls of modelling any sailing ship, whether plank-on-frame, miniature or working. Over 100 plans and diagrams and 150 photos illustrate chapters on 'getting started', hull construction, deck fittings, masting and rigging, scenic miniatures, working models, painting and finishing, and flags. A detailed bibliography rounds off a book that must prove useful to anyone seeking to improve his modelmaking skill." 7¾" - 9¾" tall. 192 pages. Illustrated with line drawings and black & white photographs.